Today we drove up to Wynola, a small cluster of shops and homes just below Julian, to pick apples and pears. 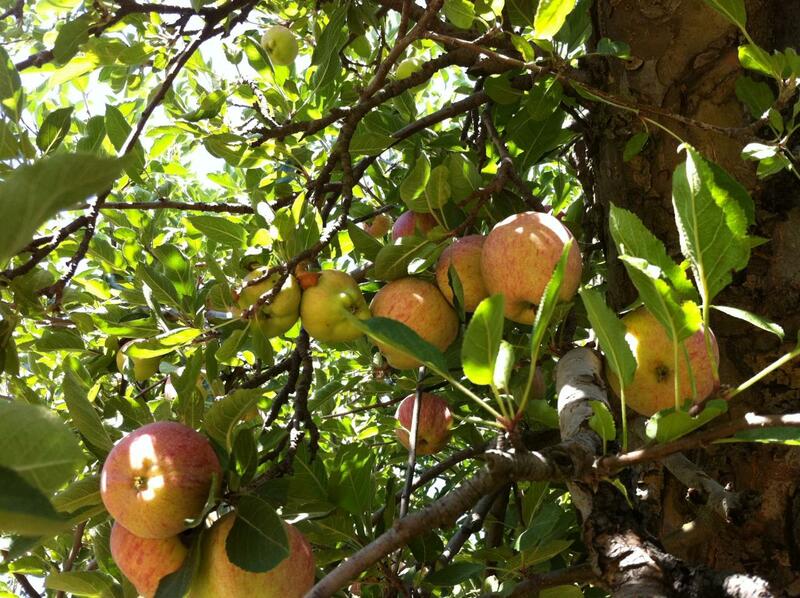 Calico Ranch has their orchard right off Hwy 78 and allows people to pick their own fruit. If it weren't for the scenery on the drive, and the absolutely brilliant, warm weather, we could have imagined to be back home in Switzerland, where we have picked plenty of apples and pears in our youth. Here in San Diego, as city folk in a subtropical climate we don't get to do this anymore. Most fruit other than citrus comes to the market from cooler regions in the Central Valley, and we see the orchards from the inside of our car on our way up I5. Hence we grabbed the chance to pick apples ourselves, on the only weekend it is possible this season because Mother Nature wasn't so free giving this year. Wandering between the trees we marveled at the ripe apples and the sunlight filtering through the leaves. Quite a few other people enjoyed the scenery and fruit as well, and happy talk and laughter drifted across the orchard. We tasted each variety of apple, Jonagold, Empire and one whose name I already forgot, fresh from the trees. 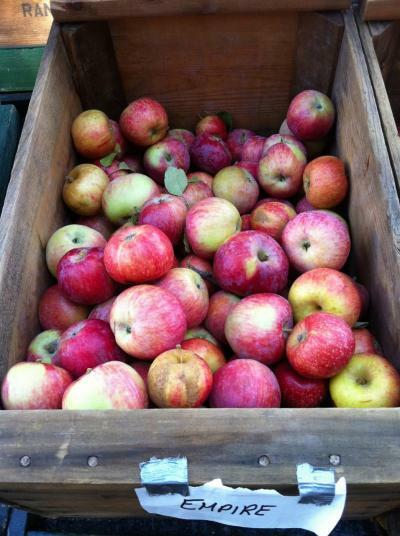 Then we headed back to the fruit stand where larger and riper fruit was ready in boxes - picked in the rearward orchards not open to the public, and filled a bag with apples, plus three pears for good measure. The apples appeared in a traditional Swiss Apfelwähe for dinner (yes, we'll post the recipe some day), and we have plenty left over for more delicious treats. But more importantly, we have a happy memory and a few nice photos, and a spot to come back to in future years. Submitted by Visitor on Wed, 2011-12-07 06:27. Wow, this is a delicious apple.